On the way from hypothesis to discovery, a researcher can easily get bogged down in the morass of siloed information, untrusted sources, and site hopping just to explore a single unknown idea or topic. The result is a lost thread where information is elusive, and knowledge is never truly acquired. With science becoming more interdisciplinary, the information researchers are retrieving currently doesn’t provide sufficient contextual knowledge for them to make cognitive leaps. Additionally, students require critical foundational knowledge when learning about a new topic, but finding one’s path through a literature search for this knowledge can be overwhelming. Simply put, students, educators and scientists need a more natural research workflow, one that is optimized for research, teaching and learning. Researchers could be missing an entire class of content in their literature searches, because traditional search technology prioritizes journal articles and search engines generate an avalanche of results, in which it may be difficult to find the most relevant sources. Researchers have often found it hard to easily discover the valuable information in scholarly books-- the critical content that has the potential to speed research, improve decision-making and spark new insights. Librarians have been missing accurate analytical data, too. Many available literature search tools don’t reveal the paths researchers want to take, the topics that might expand their understanding, or vital, but often hidden, contextual sources. These tools don’t guide researchers to the sources they need, when they need them. So, when researchers don’t arrive at those necessary sources, librarians never receive data on what those sources might be. Elsevier has combined technology and content to develop a new tool that improves the research process. 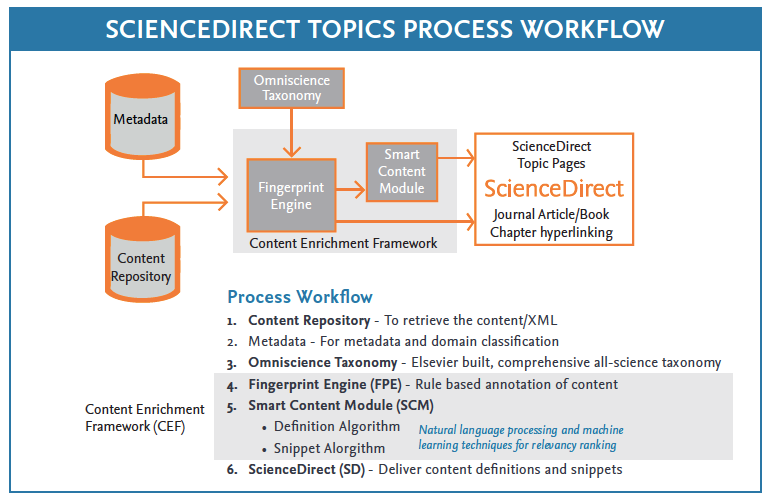 ScienceDirect Topics offers information seekers – from students to the most seasoned researchers – credible, accurate and relevant content, right at the point of need in their workflows. The enhancement provides tens of thousands of topic pages on the ScienceDirect platform, each containing succinct and selected contextual information taken from reference books, offering definitions, snippets from book chapters and related terms in an easy to browse format. By hyperlinking specific concepts found in journal articles to topic pages, the enhancement improves reading comprehension for researchers at all levels, and guides them on the path to discovery. ScienceDirect Topics, which are also indexed in search engines to increase discovery at all points for a researcher, reveal both contextually relevant information as well as enabling a quick route to onboarding researchers to an unfamiliar topic. Elsevier has used the latest technology to make content more accessible and surface hidden but critical resources to create an easy workflow for researchers to improve their outcomes. Topic pages on ScienceDirect are generated using innovative automated approaches for information extraction and relevancy ranking. More than 100 Elsevier employees collaborated to build and deploy this feature. Their first step was the development of taxonomies that correspond to concepts in Elsevier’s body of content. Elsevier’s Omniscience team created and curated taxonomies for the domains in scope. 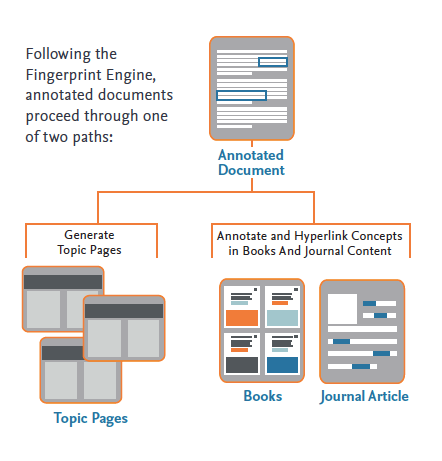 From there, an in-house Elsevier system called the Fingerprint Engine (FPE) enables the indexing of book and journal content and “annotates” or tags taxonomy concepts in these documents. Once documents are annotated, they can move through two different pipelines: to generate a topic page for a concept or to annotate and hyperlink concepts in journal and book content. For the actual topic page creation, FPE annotations for book chapters are sent to the Smart Content Module (SCM). The SCM is the “brains” of the ScienceDirect Topics operation. In the SCM, an algorithm is applied to all the book content the FPE has tagged using heuristic techniques, and determines how relevant certain definitions or snippets are to a particular concept. For definitions, the data is ranked or eliminated based on a set of scores that use a suite of natural language processing (NLP) techniques to determine relevancy. If a viable, stand-alone statement can be deemed a sufficient definition for a concept, it will surface on the topic page. Based on ranking only, the best definition will make it to the page in a “winner takes all” approach. We select the best definition to make a fundamental difference in the research, by improving a reader’s understanding of a term or concept. Snippets are also sorted on relevancy and ranked. In the case of snippets, a concept will generate a topic page only if at least five snippets are found to be relevant with a maximum of 10 snippets showing up on any given topic page to ensure the optimum amount of information is provided to the reader. These snippets are sections of book chapters extracted on the basis of their relevancy to the topic to create a free layer of content for online researchers, unlike traditional search tools that offer only an abstract or summary. This information will help readers with their immediate information needs while they determine whether the full book chapter will be of further value to them. Snippets provide information from multiple perspectives around a specific topic, to help researchers more easily identify the right mix of content to support their research. The second route of an FPE annotation set takes it right to ScienceDirect for article and chapter annotation and hyperlinking. Here the FPE outputs are curated and sent to ScienceDirect to be rendered on the front end, allowing users to interact with the topic pages directly from journal articles and book chapters through hyperlinking terms to the relevant topic pages. This integration increases the value of both journal and book content by making the reading experience more dynamic. It also improves users’ reading comprehension and interpretation by integrating definitions and concept overviews - written by experts in the field and peer reviewed - directly into the reading experience through ScienceDirect Topics. From the perspective of book value, the discoverability of book content is increased by offering researchers relevant content at the point of need… ensuring that a qualified end user has actively found and chosen this book chapter based on reviewing a section of the chapter that has already been revealed. 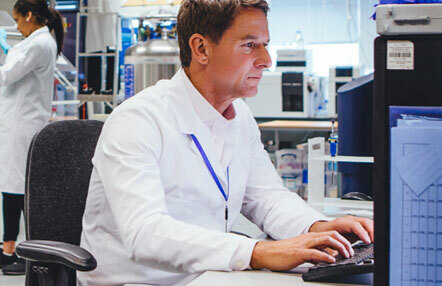 The ScienceDirect Topics technology enables Elsevier to strengthen its partnership with librarians by addressing some of their greatest challenges and ideally making their jobs easier. By surfacing the answers their researchers need from newly unlocked sources at the right place and right time, ScienceDirect Topics reveals the true demand for the content. It enables librarians to curate a library that fills the connective gaps for its patrons and guides them on a better path to discovery. Accessing the new features will generate additional analytical reports, to better inform librarians’ buying decisions. The ultimate “keepers of the content” will know what resources are used most often and how, and if there are opportunities to buy books or encyclopedias to increase the success of their researchers, educators and students. The enhanced reading experience also will increase the efficiency of library patrons in discovering reliable content in a way that fits into their research workflow, saving them - and librarians - time and effort. Offered free of charge to ScienceDirect customers, the topic pages facilitate the co-usage of journals and books which are so complementary and fundamentally interlinked. They also increase discoverability of purchased books, further leveraging the library’s investment. Elsevier has surveyed librarians about ScienceDirect Topics, and more than 75 percent of those surveyed believe the integrated content development at play in the new tool will increase eBook usage in their institutions. In a related finding, nearly 70 percent of the librarians expect an increase in the value of their purchases, knowing that the content is being maximized by greater exposure to their constituents. ScienceDirect Topics is fostering a community of users, already providing feedback to Elsevier on what works well and what needs more improvement. Elsevier will continue to look at user needs and workflows, and how ScienceDirect Topics fits into various stages of the research process. Elsevier will constantly assess the impact of this innovative research tool. Using key performance indicators and success criteria, it will generate analytics that analyze editorial gaps, and data that help guide the ongoing direction of ScienceDirect Topics to optimize its value and address user and customer needs. ScienceDirect Topics will evolve from a technological perspective as well, as Elsevier leverages technology advances to further improve this feature as usage increases. Helping users access the right information at the right time makes a huge difference in the outcome of research and education. Researchers, educators and students all benefit from a more streamlined way for them to conduct research, and librarians who provide those tools become part of successful and competitive teams. Adding more than 100,000 topic pages in wider subject areas in the coming year, ScienceDirect Topics is indeed the way of the future, surfacing relevant content when and where it’s needed to guide researchers on their path to discovery.